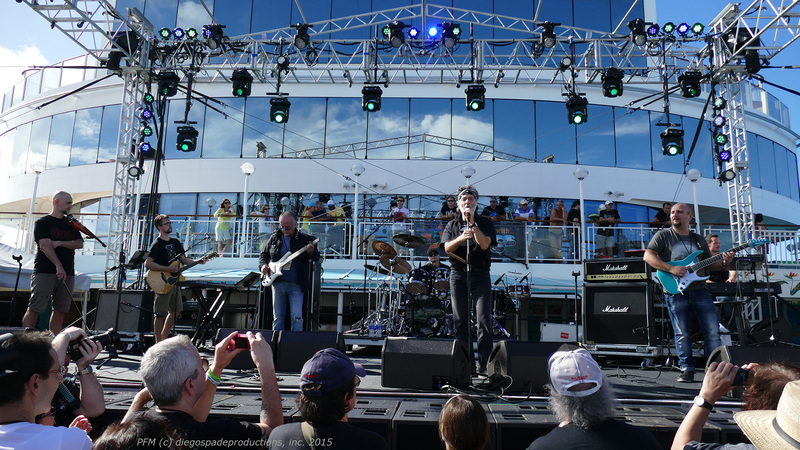 Last month we attended the third annual progressive rock festival, Cruise To The Edge. 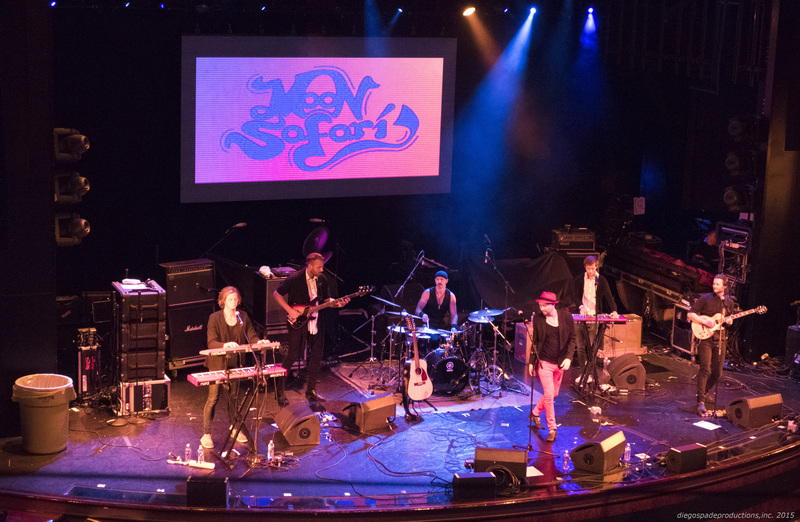 Of the many performances on that voyage, including sets from Yes, Marillion, PFM, Three Friends, Martin Barre, Moon Safari, and so many others, there was one group that made a very rare appearance, and stood out from the pack, and that was Swedish progressive rock band Änglagård. Their two sets were masterful, florid demonstrations of the sonic power and grace that this genre can attain. Änglagård charted a new course for the progressive rock genre beginning in 1991 with the release of their debut Hybris. 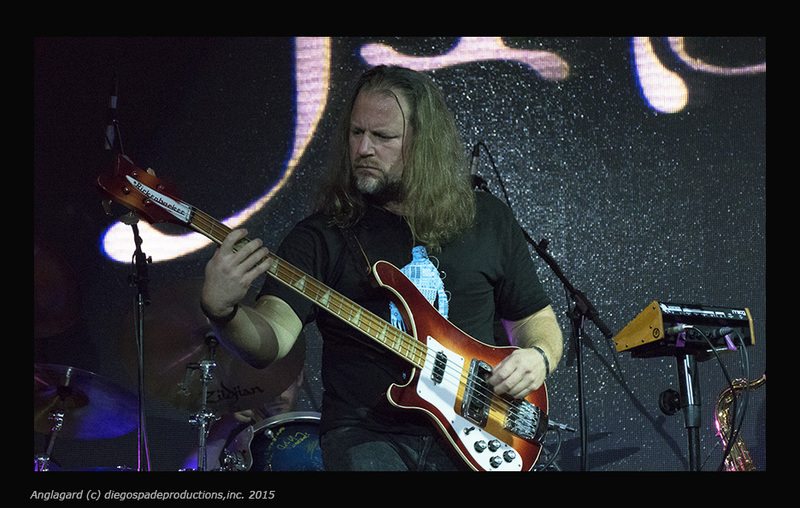 With influences such as King Crimson, SFF, Shylock, Ragnarok and other European bands, Änglagård incorporated flute and acoustic instruments, along with electric guitars, keyboards and vocals, all anchored by Johan Brand’s confident leads on Rickenbacker Bass and then drummer Mattias Olsson’s massive array of toms, bells, and varied forms of percussion. The debut was a spectacular, influential masterwork that drew audiences already attuned to the prog genre, along with new fans attracted by the mix of beautiful pastoral and euro-folk songs infused with powerful, metal passages. us” described as “melodies and riffs of all kinds flying across the room. Intricate drum patterns, whining guitar, ripping bass lines, beautiful Mellotron, proggy Hammond riffs, fuzzy Wurlitzer melodies, blistering saxophone and ornamented flute.” It’s an amazing document of a band coming back to form, and going beyond their beginnings, captured at just the right time in front of rapturous fans. It’s the launching point for their work on a new album. Johan: Everyone in the band has amassed quite a lot of new written material that we are going to put together now as new Änglagård songs. I dare not comment on how the new record might sound. 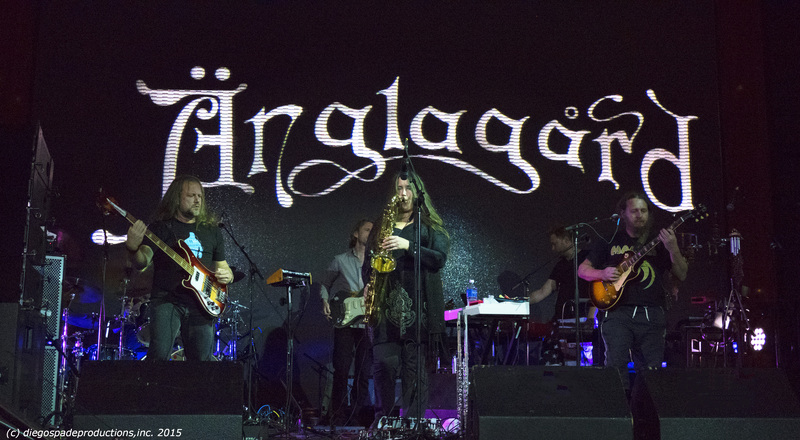 But we are not a band which softens with age and begins to play more readily available prog …No… Änglagård are uncompromising when it comes to song composition, sound, recording and artwork. Therefore we will complete the entire process ourselves. We are being meticulous in creating a new record will have the same high quality as the early albums. I dare not say when the record will be completed but it shouldn’t take 10 years this time! What I can say is that we plan to record each track as much as possible live in a studio environment. We think it is important that the material have grove and feel real and free. In the meantime, fans and newcomers will be interested to know that this month the Japanese record label, Disc Union will release a deluxe CD box as a tribute to the album Hybris titled 23 years of Hybris. For any fan of progressive rock, or adventurous music in general, this will make a stylish holiday gift! Every attendee I talked to was excited to vote for Änglagård’s return to the next Cruise To The Edge voyage planned for 2017. Let’s hope that happens, as this band embodies modern progressive rock, and deserves to be seen and heard by every fan of the genre. 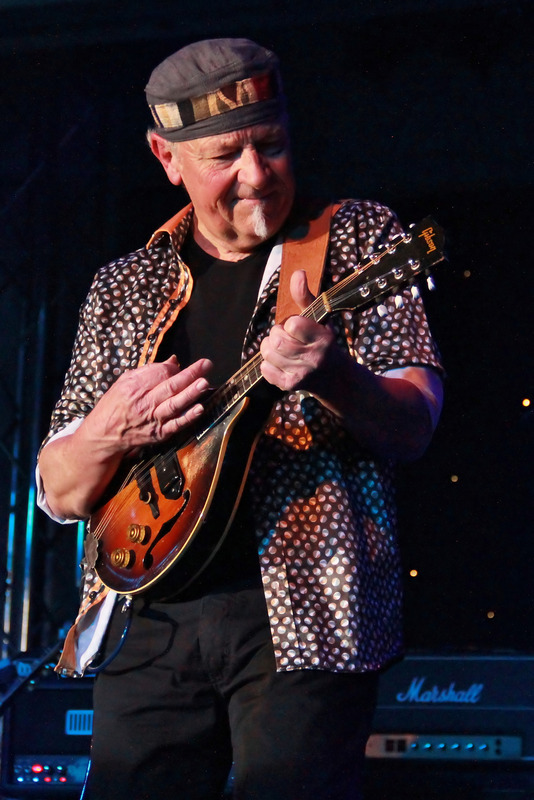 Martin Barre is the legendary guitarist who graced every Jethro Tull album after the very first, beginning in 1969. He’s been building an increasingly successful solo career for years now, and has a new album this month, appropriately titled Back To Steel. 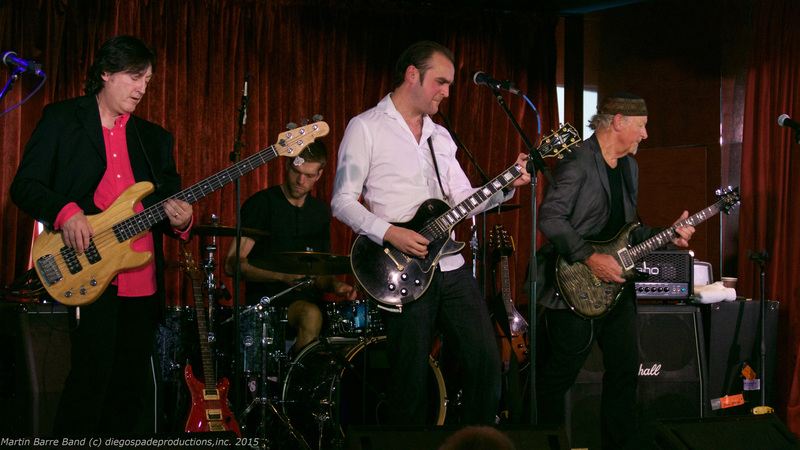 The album is a return to form for Barre, a finely honed collection of guitar-driven blues-rock. 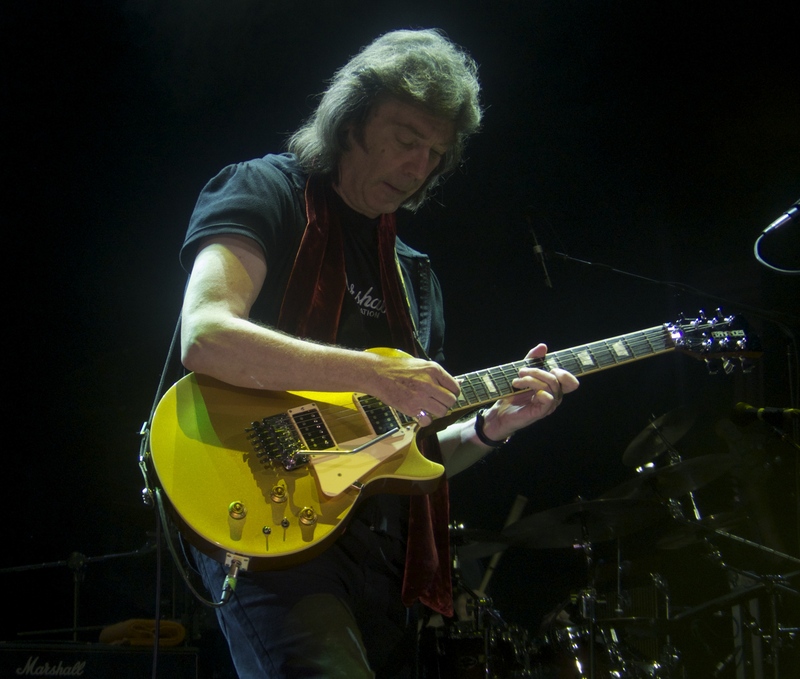 Two Tull tracks, “Skating Away” and “Slow Marching Band” are re-imagined – the former highlighting Martin’s intricate melodies on the mandolin backed by his lyrical fat guitar chords. 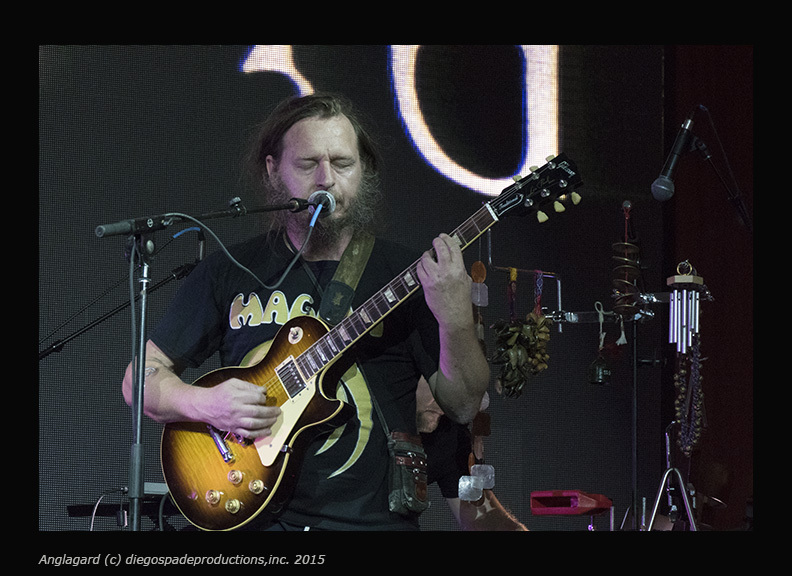 Even better, Martin leads his band through powerful new original tracks, which highlight his unique style of blues and hard-edged rock chops. It’s available in the shop on his official website. After a few recent dates in the U.K. Barre continues this year’s tour with several gigs in France and Germany, followed by a series of nights on the east coast of the U.S., beginning with a voyage on Cruise To The Edge in November. Check here for dates and tickets. Martin, how has your band and approach changed on the new album Back To Steel? I’ve had my own band for 4 years now, and it’s changed here and there, and developed into the current four-piece band. Occasionally we have backup singers join us. When we go out as a four piece it’s sounding really powerful. I like the space and the dynamics. 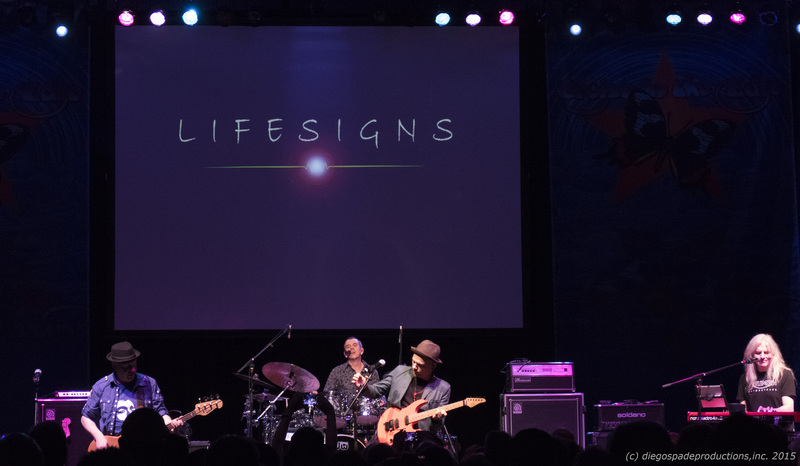 The new album is pretty well summing up what I’ve been trying to do for four years, writing my own music – a little blues, prog and rock music – its really a statement of where I’m at in the moment and a pointer to where I want to be in the next few years. 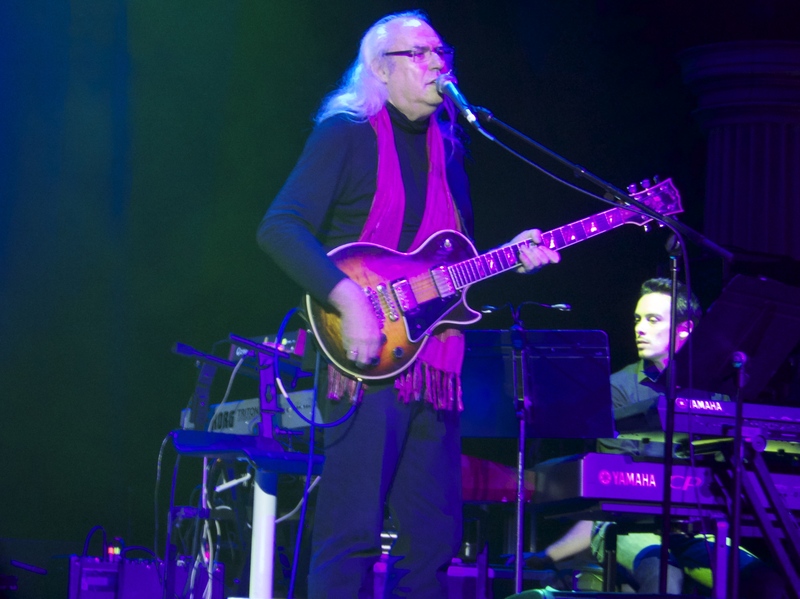 The set list for the last tour included covers of Bobby Parker, Beatles, Robert Johnson, BB King, Howlin’ Wolf songs along with Jethro Tull classics. How will the set list differ in your upcoming shows? The set list is changing as the new album is just coming out. We’ve been playing the new tracks here in the U.K. and they are going down well. It’s a good feeling, because audiences haven’t heard the new album and are coming in cold, and we’re getting a great reaction. I still like doing some Bobby Parker stuff and some Robert Johnson and I enjoy playing them. We have more music to play then we have time to do – if the venue says we have an hour and a half, we are disappointed, as we want to do at least two hours. I struggle with decisions as what not to play rather than the other way around. How do you pick the Tull tunes for this show? Do you still feel that songs like “Aqualung” or “Locomotive Breath” are musts? We have probably ten Tull tracks, a good selection, that we like to do. When we played in Scotland last weekend, it was the first time with my band. We started playing “To Cry You A Song” and there was a gasp in the audience, not of horror but of anticipation – it was really nice, as they had no idea what was coming. 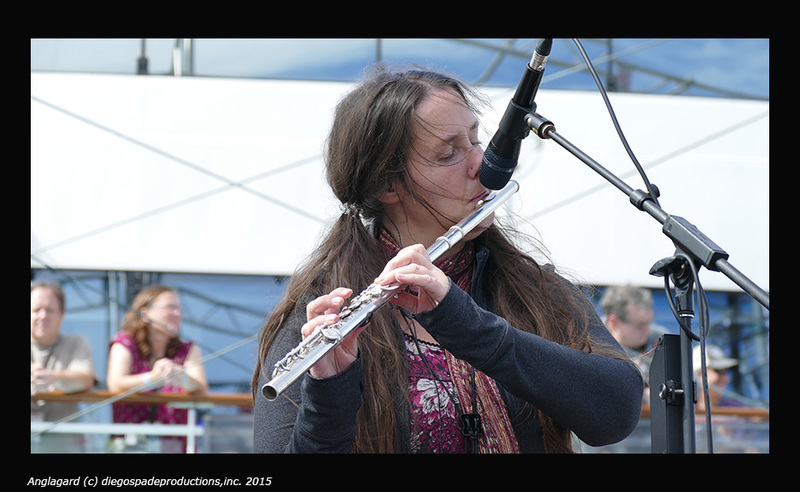 It’s really good fun to play the Tull stuff. I do have my favorites but I pick things I think will work well with the band and our sound, our current program. I probably have Tull songs I like better, but wouldn’t work with the band. There are some really great songs that are less well known. That’s why I play “Slow Marching Band” for instance on the new album. Back in the day with Tull, I wrote out the playlist for the concerts. But later with Ian’s new vocal range my input diminished. 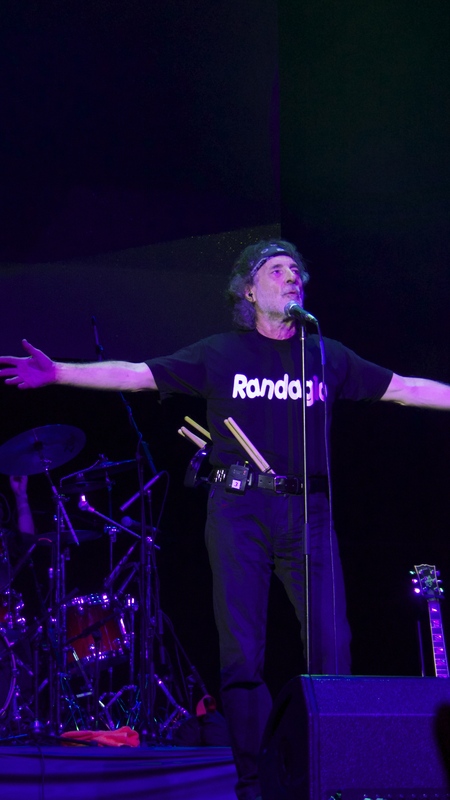 I like arranging set lists with production ideas – everything to do with the band. Now I’m able to do that and have lots of ideas – I’ve got a big catalog to draw from. I’m less interested in a verbatim version of any song – I like to project something new – a different arrangement. On “Sweet Dream” for instance I changed the riff to the downbeat. I like doing that, making it more biased to a guitar quartet. 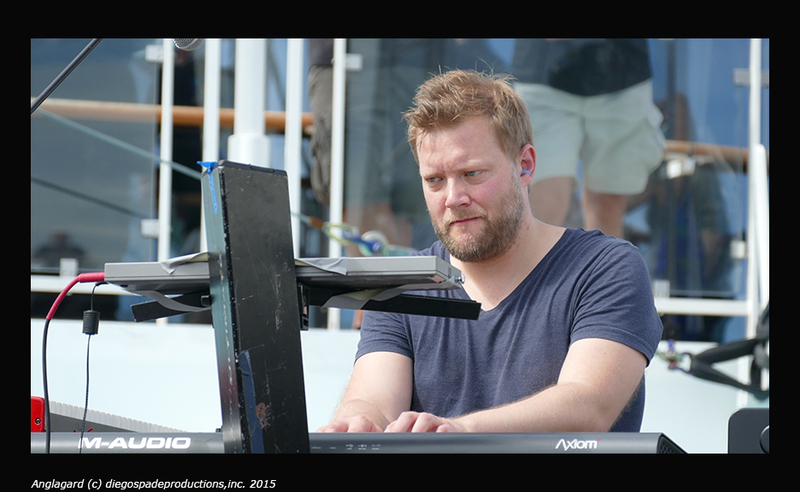 Where did you find your excellent vocalist Dan Crisp? He sounds just right for this music, with a nice vibrato and strong mid range register. He’s a little treasure, our Dan. He’s the son of a friend of mine. We became friends, based on our mutual like of music. We did some shows as a three piece in the south of England and it was really good fun. It developed from there. He was so close to home but at first I didn’t see it. I finally suggested bringing him on and it was the start of a really great period in the band. He’s developed into a very strong front man – really come into his own. 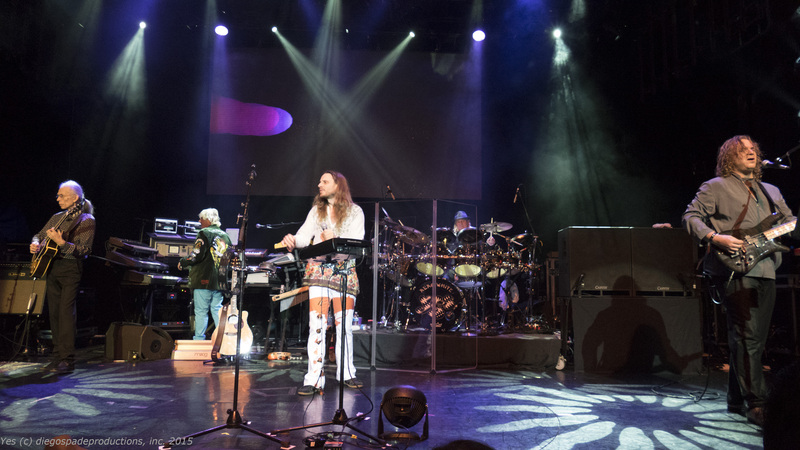 On Back To Steel, there are no keyboards or wind instruments – will these be added for the tour? We are trying out different things. The original band had six members, including flutes, saxophones, and whistles. 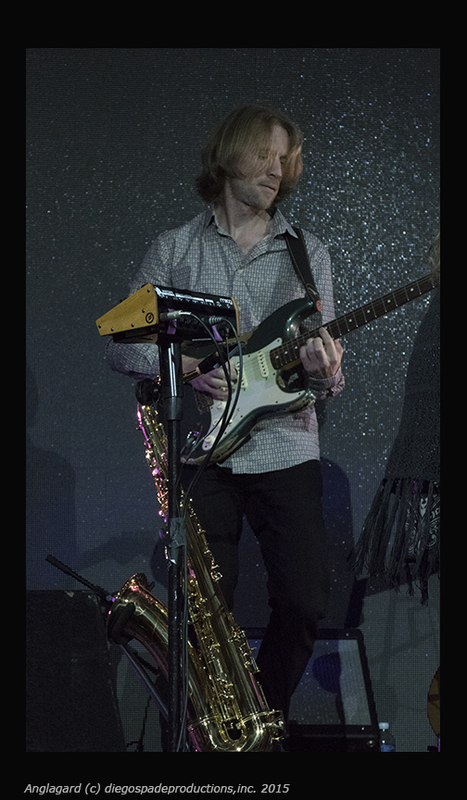 It was an intense amount of music put out by the band – really at the end of it I didn’t have enough room, and I really like space in the music – times when there is nothing going on – maybe just one instrument. So I’m taking it down to the basic bones. I tried it live and on the first night it felt ridiculously empty, but by the end second gig it was great – it was exactly what I wanted. I quite like the idea of adding back the Hammond organ at some point. I want it to be flexible and exciting for the band. What is your take on the Steven Wilson re-masters of the Jethro Tull albums? This might shock you, but I haven’t heard anything from these releases. These albums are a reference for me. If I were looking to add “Back Door Angels” to my set list for instance I would probably just listen to that song a couple of times as a reference musically. For most of my life I was with involved in Jethro Tull and I respect it and I owe a lot to it, but its not music that I am playing recreationally. If I were going to see new music on my time off, I’d see Snarky Puppy! Any update on the tour and your upcoming date with Cruise to the Edge? 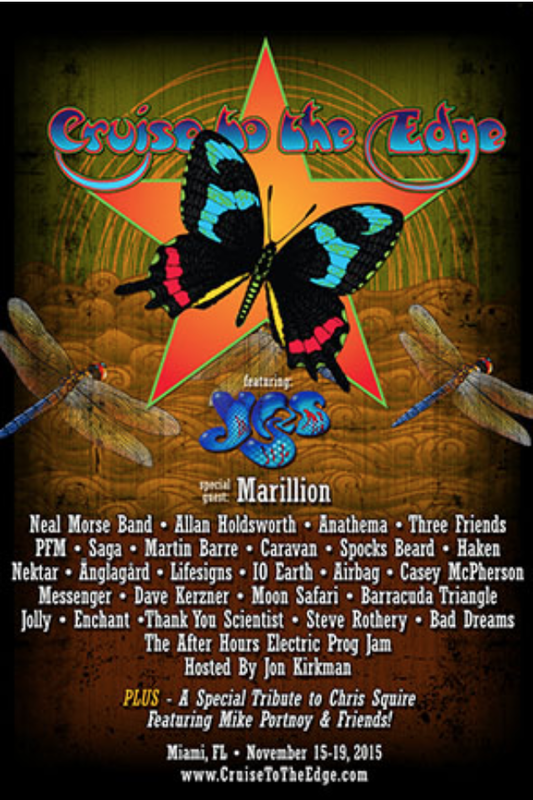 I’m really looking forward to Cruise To The Edge – that’s going to be quite fun. We have a series of dates planned on the east coast of the U.S. after the cruise. The plan is to do central and west coast dates in the states next year if all goes to plan. 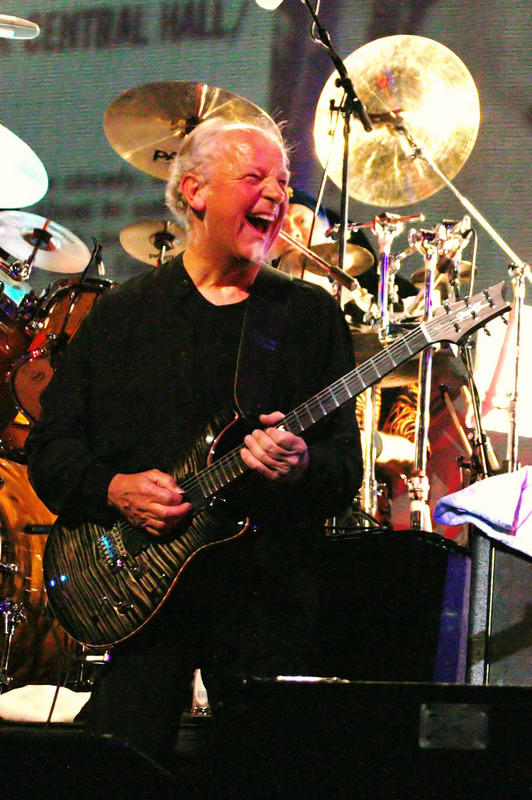 Catch Martin Barre at one of these upcoming shows – given the mix of new songs, and Tull classics, delivered by his crack new band, they promise to be excellent! I’ve had a life long passion for all things Jethro Tull. This superb band, led by Anderson/Barre, released 20ish studio albums over 30 years after forming in the late 1960’s, beginning with This Was in 1969 and ending with J-Tull Dot Com in 1999. These along with a number of collections, live albums, and a Christmas album from 2003 represent one of the great catalogs in rock music history. One of the first two proper rock albums I ever owned was Tull’s breakthrough record Aqualung. Not only did the album sport amazing vocals, acoustic guitars and flute from Anderson, but also Barre’s searing hard rock riffs dominated most songs. The opening chords alone are instantly recognizable, establishing the album as one of the top classic rock album for the ages. My interest in Tull reached a fever pitch in 1973 when they released the album A Passion Play, followed by 1974’s Warchild. The musicianship on these records is off the hook. 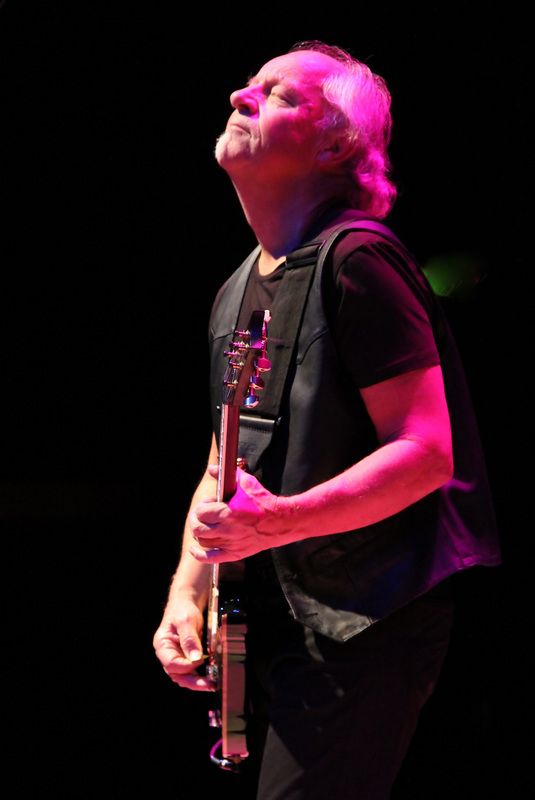 Anderson’s vocals were never better – something he recently called “chamber rock” style – and Barre laid down some of the most complex lead guitar work on record. The tour for A Passion Play was one of Tull’s most theatrical. The show began with an extended “Lifebeats” prelude – a long series of electronic beats like the quickening pulse of a heart, along with films depicting a ballerina rising then later plunging through a mirror. The interlude, “The Story of the Hare Who Lost His Spectacles,” was presented with a surrealistic film featuring animal costumes, and a type of maypole dance. Both Anderson and Barre punctuated the intricate music by leaping about the stage demonstrating showmanship and aplomb. During our interview Martin confided that he probably only played the ever-changing piece all the way through without mistake once over the long tour that followed. 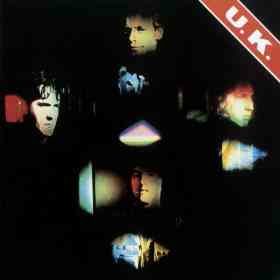 In interviews, there has been some distancing from this album, noting the critics were critical, and the band probably went too far. Barre told me there was quite a bit of humor, with many references to the type of silly comedy made popular by Monty Python. But for fans of this artistic piece, the composition is one of their most serious and enduring works, questioning nothing less than the nature of death and the afterlife, of heaven and hell. “Geared toward the exceptional rather than the average” as Gerald would say. 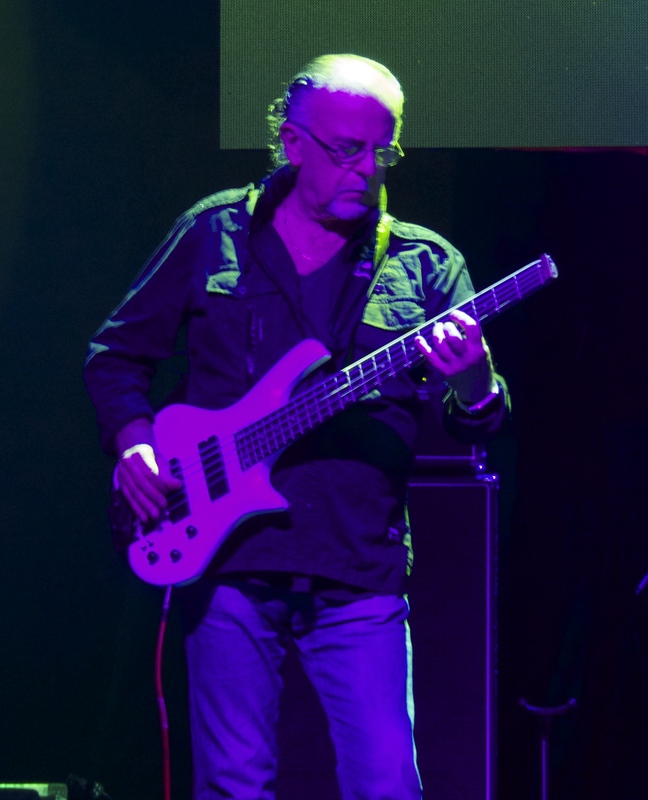 Even though Tull has been retired by Anderson, it’s a pleasure now to be able to go hear Martin playing a combination of his own material and that of his former band, and we are all the better for it. 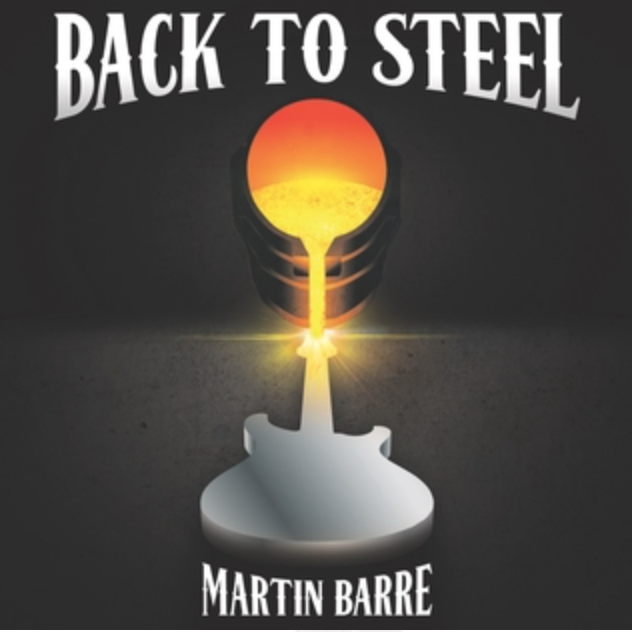 Back To Steel: A rocking new album from Martin Barre featuring 12 original songs and 2 Tull classic tracks re-worked in Martin’s unique style. 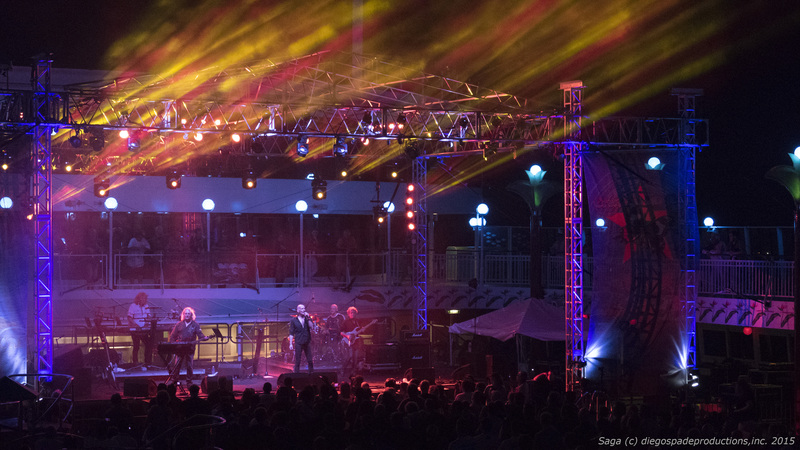 Yes organized and headlined the recent concert and ocean voyage aptly named “Cruise the the Edge” this April 2014. Current vocalist Jon Davidson has never sounded better – he reached for some of their highest notes with a power and clarity of tone that I’ve not seen surpassed. There was joy, peace and some Yes gospel in his strong performance. His stage presence and confidence has improved measurably over the last several years. 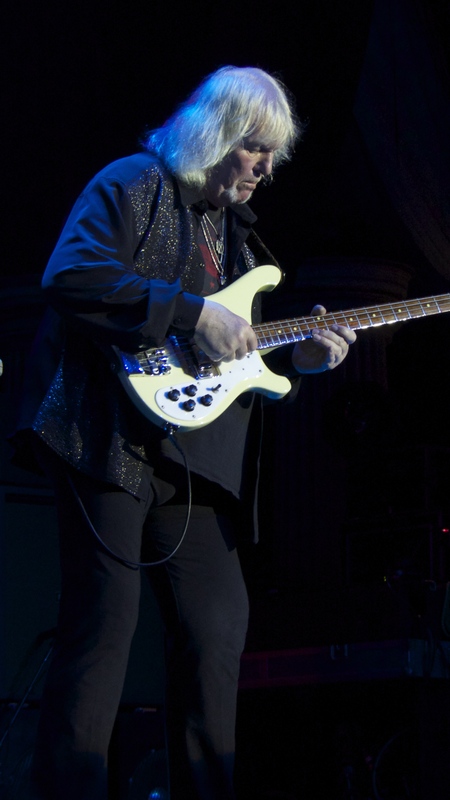 Chris Squire (bass) still packs a punch with his bass and projects a deep happiness at plying his art after all these years. His playing is unique and seldom duplicated elsewhere. 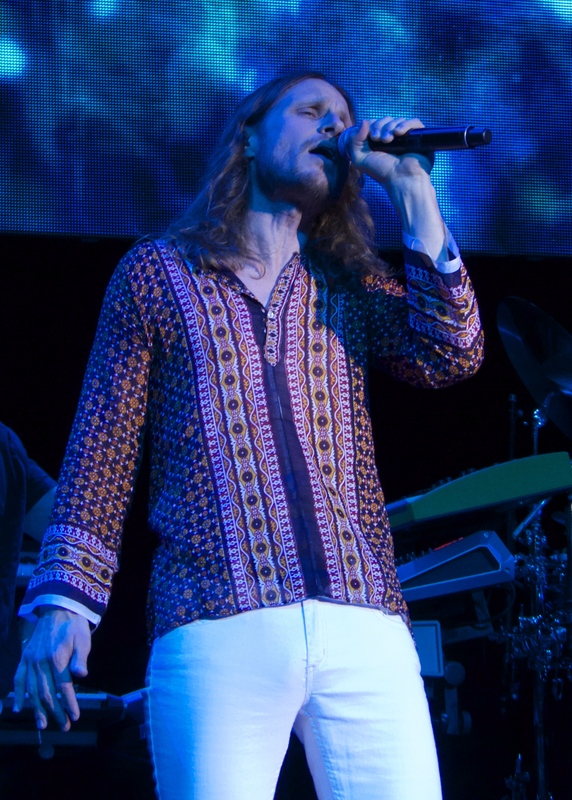 His voice has magically held up all this time – a key ingredient of the Yes sound. 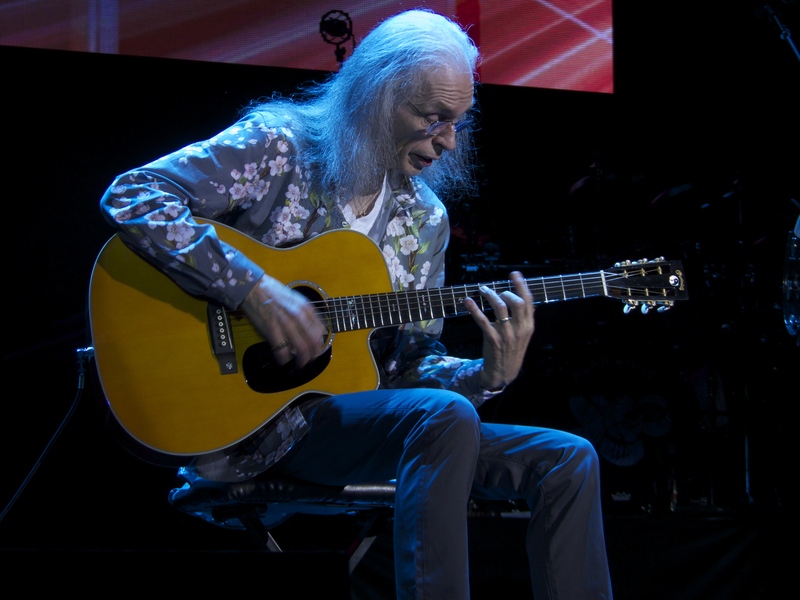 Guitarist Steve Howe must be responsible for the tendency they have now to reduce the pace of much of their work – while this may drain a bit of the frenetic energy out, he is able to play all of his licks with stunning accuracy. It renders his performance a master class for any budding guitarist or aficionado of fine fretwork. 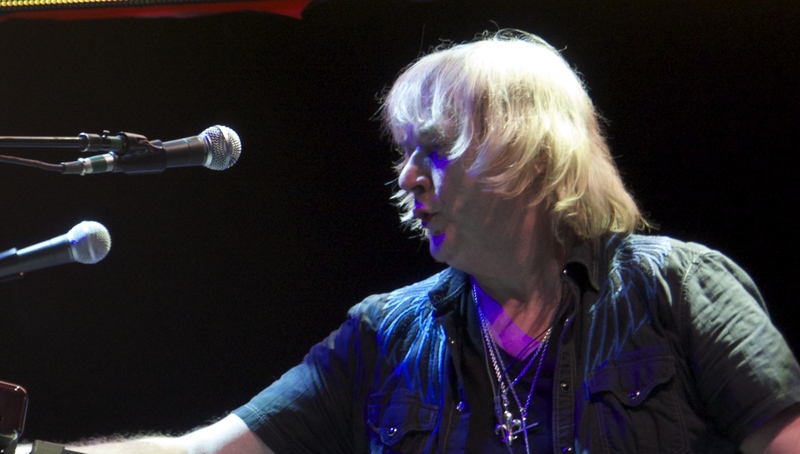 Keyboard player Geoff Downes is always a pleasure to hear – while it would be awesome to include more tracks on which he originally played into the set, it was great to at least hear “Tempus Fugit” off 1980’s Drama. Alan White had a somewhat off night. I feel badly saying, can’t blame anyone for slowing up a bit – and possibly the laconic pace of some of the tracks inhibit a more energetic performance, but its something for them to work on. 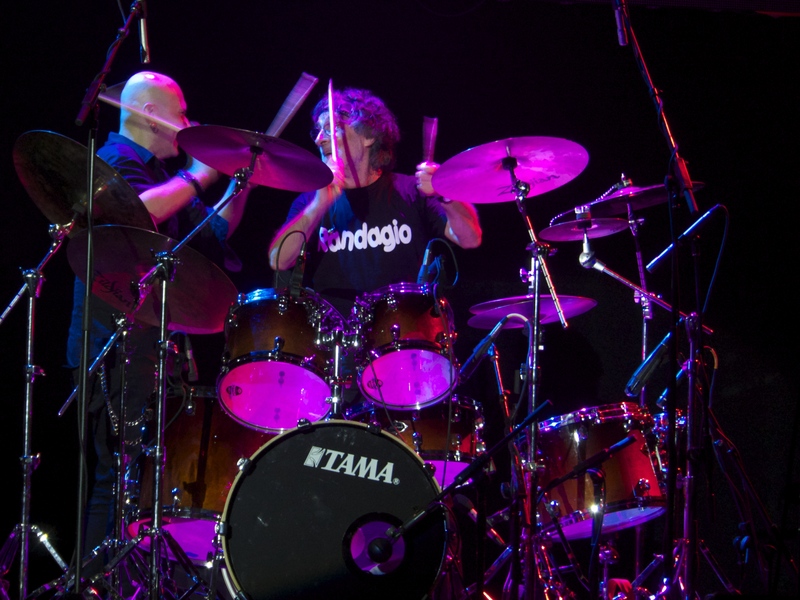 Alan’s has delivered some of the finest drum and percussion work of any progressive rock band in concert over the last 40 years. Having said all of that, Yes is in fact performing their early masterpieces, many of which should be played long after they and we are all gone, in the tradition of classical music. 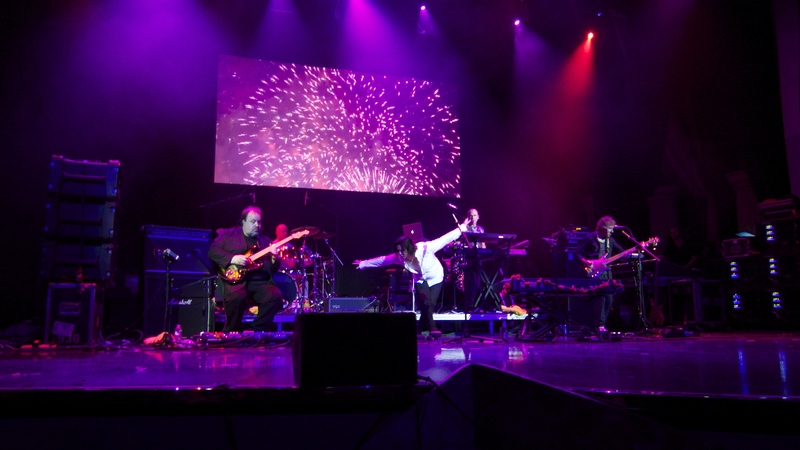 And, they have always steered away from medley’s – a scourge that long plagued another famous prog rock band from the era – so it’s nice to see and hear them play these spectacular tracks in their entirety. 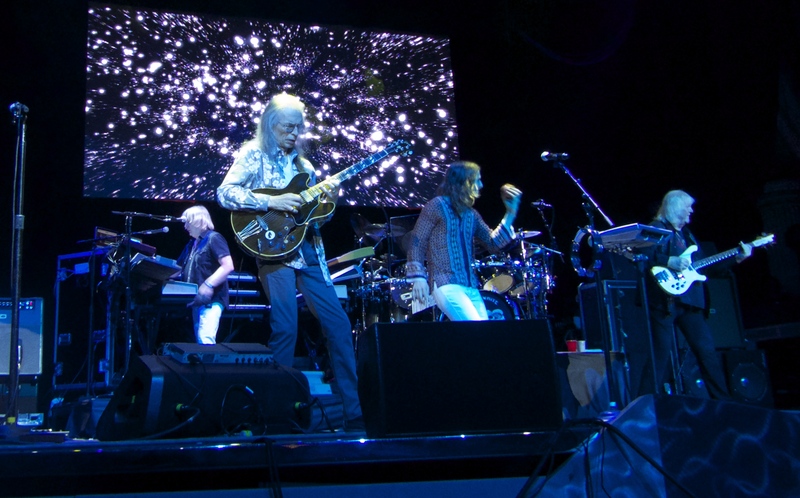 I am definitely of the camp that hopes Yes keep up their touring, hoping they vary the set list, but keep at it, as this band are one of the few key practitioners of the original form that still produces a powerful progressive rock concert experience. Waiting with high expectations for HEAVEN & EARTH, their new album, to drop. 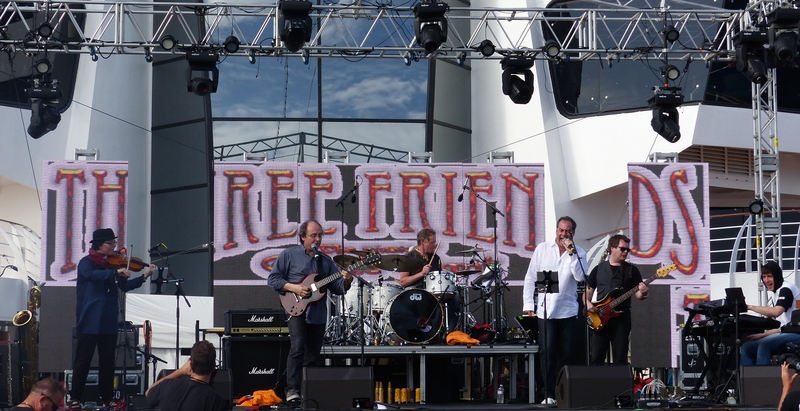 Premiata Forneria Marconi (PFM) appeared live on the Cruise to the Edge concert voyage April 7-12. 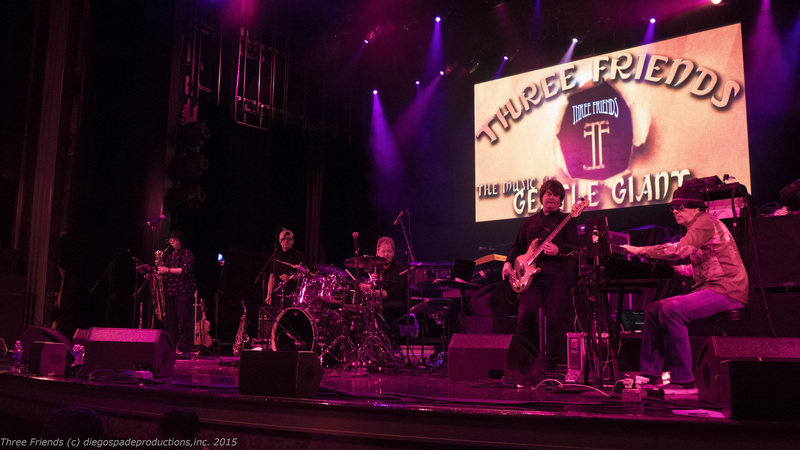 The shows reinforced why they have been one of the premier international progressive rock bands over the years, and their playing is undiminished by time. PFM’s music, while sometimes touching on dark themes, is overwhelmingly positive and joyful, particularly when the music incorporates snippets of traditional Italian folk within the progressive, jazz and pop music formats. Many fans consider their best work in live performance, of which there are many official recordings available. Unlike some contemporaries, they still play complete works in their original form to make up their set list – lots of early work, such as “La Carrozza di Hans” from their first Italian release Storia Di Un Minuto (1972), to “Romeo E Giulietta” off the beautiful new Pfm in Classic-Da Mozart a Celebration (2013). 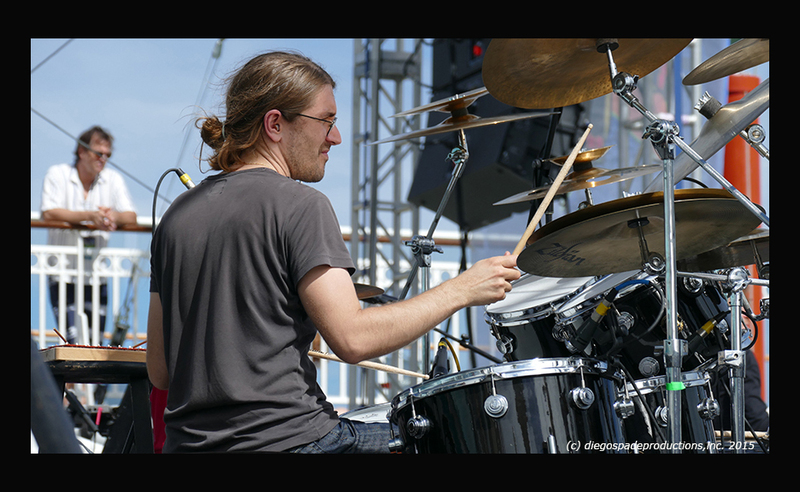 There is a high degree of precision in their live performances, but also room left for jamming and improvisation. 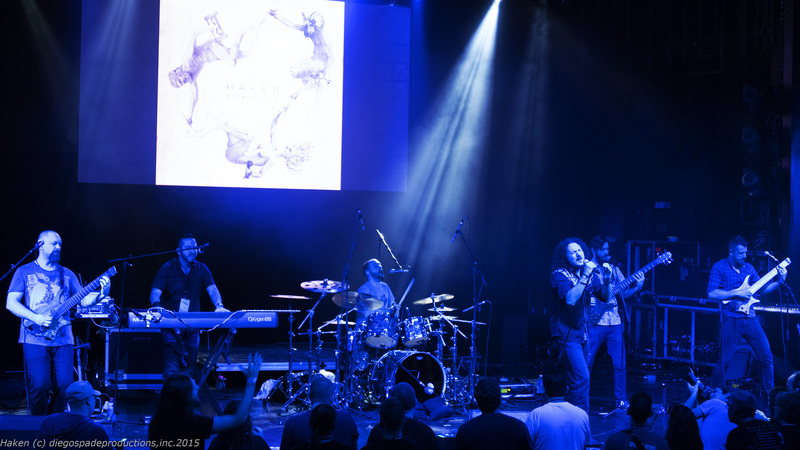 These days drummer/vocalist Franz Di Cioccio has a backup percussionist leaving him several chances during the show to come out front with lead vocals and enthusiastically rally the crowd. It’s a rewarding experience to capture PFM playing live. D: Can you tell us a bit about how your popularity was built outside of Italy? 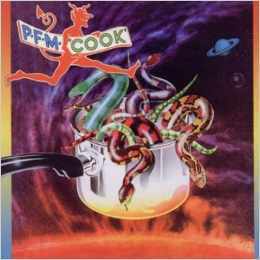 PFM is the best-known and most famous band of this kind in Italy. At the start, we came to the USA and UK and stayed there for 6, 8, 9 months at a time – you have to build up the following in country. We thought with a worldwide mentality – we did not think only in the Italian way. But we are Italian, we know the mother language –and there are a lot of things that anybody who goes into art must consider. We did the best with our potential – for example leaving home touring the USA for a long time in a lot of places – big towns but also places like Grand Rapid, Fort Wayne – you have to be out there and the people love it and know you are really an international musician. Our big opportunity was when Pete Sinfield from King Crimson liked our music. He found in PFM– a new renaissance of a theatrical mentality and creativity. He wrote incredible lyrics for our music because our lyrics are not as good in Italian – the image you get from music and lyrics together in English is fantastic. “River of Life” for instance – the combination is fantastic. In Italian it’s not quite the same – it’s got to be the right music combined with the right lyrics. D: Having said that, if I could pick one of your Italian language songs on albums Per Un Amico or L’isola di niente and translate a lyric to English – what would be a favorite? PFM: In English words are very short and it’s fantastic for rock because it will get you moving. In Italian everything is more about drawing out the syllables (sings a bit of “Dove Quando”) and it’s more melodramatic. We didn’t translate that one – even Pete said you don’t need to translate this lyric because it’s perfect in Italian. The same is for “Il Banchetto.” English is more clipped and there is better possibility to carry the idea. When you want to communicate something from the heart use the vocal melody – you can use the round vowels to carry emotion. Another example is from our first album – our song “Generale” which has no Italian lyrics – they would be difficult in Italian – Pete made it easy – “shiny shoes he runs to catch the train…rockets launched if he is late again…” (sings and taps this out to the beat of “Mr. Nine Till Five”) and it makes the melody different – we made a melody to support the Pete Sinfield words that we didn’t have in the Italian version. By contrast, when opera is in Italian or German – you can’t do it in English. D: Cook – the first live recording released by PFM, was recently re-released with the entire concert included and it’s a stunning document that displays the bands full range – was there a discussion at the time of putting out a 3 album set? PFM: No we did not try to get it out – did not have the time. We were not even supposed to do a live album at that moment – we had access to a recording studio which was paid for but unused. We decided to use it and we were playing in New York – so we used the time to make the record and taped a few more shows. We decided to do one album – to make something very accessible to the people – to represent PFM with one album – and cost was a factor – double albums are expensive – three even more. Now you can do these box sets and legacy collections more easily. So we did the best in one, and made it more successful. I even decided to cut my drum solo! D: Franz, back in those times, did you have drumming support – it’s entertaining when you come out front during shows today. 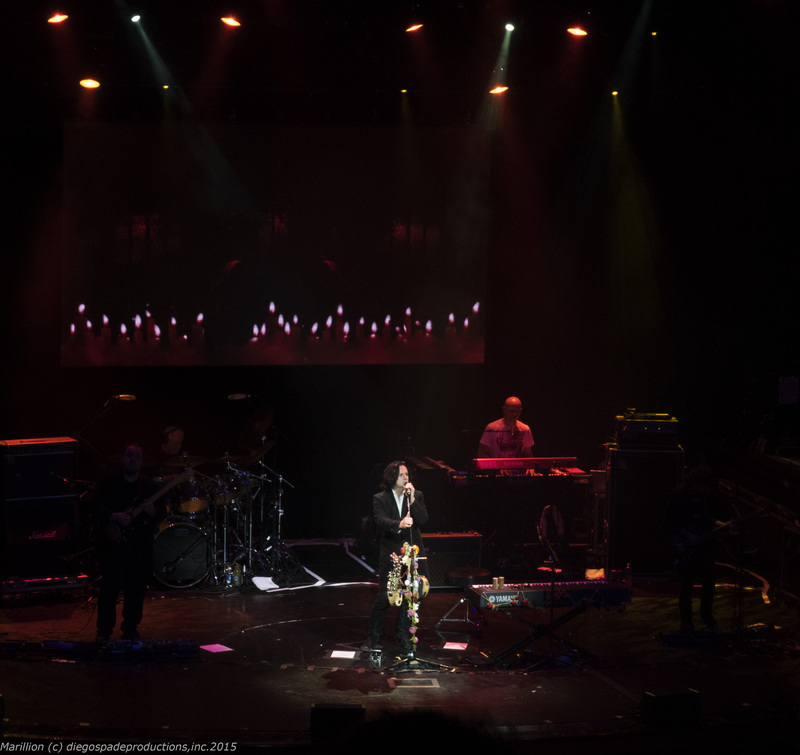 PFM: Not at that time – I stayed back on the drums with a mic. When we used to play as a 5 piece, everybody sang something because there was not really a singer with that one role in PFM – our voices mixed together. I did sing “Dove Quando” and “Just Look Away” up front because the drums only came in at the end. D: Chocolate Kings was the first of several albums with Bernardo Lanzetti out front on vocals (from 1975–1977). It’s an album that gets talked about more than Jet Lag – yet I find Jet Lag is just brilliant – did it not do as well? PFM: The music did get more difficult and this is the way PFM has always been – we play what we feel like playing in the moment. At that particular time we were living a lot in the states and had a lot of contact with jazz musicians and we had more jazz influence – some of us more than others and it went in that direction. We did not really think about “why or why not” – we did it because we liked that music at the time. Maybe people did not expect anything like that from PFM. It was more improvisational – its a different way – we used to improvise a lot. 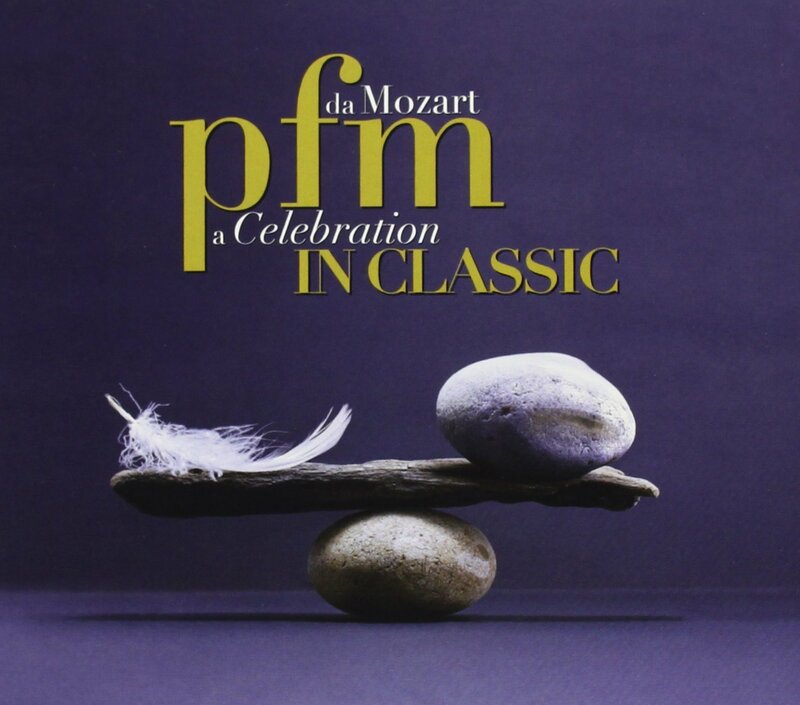 PFM always changes album by album – we didn’t want to stay the same for each one – for instance our latest, Pfm in Classic-Da Mozart a Celebration, is different from all the others. It’s not planned – not decisions we make but it just comes – its why we keep playing with the same interest because we always do different things. If you play the same thing all your life – whoever you are and how good you are – you get bored and you don’t get better. You are just doing the same thing all the time. For us its nice to have the influence of all kinds of music – for instance the 2006 record Stati di immaginazione – this is the record where you really understand the way PFM is – where we put a little bit from all the experiences from all the years – so every musician comes to the project with all of their background, and this is what’s important to us. This is why we can do the Mozart work. It was very difficult to do the Mozart album – it’s easy to score or play with an orchestra doing what everybody else does – which is either playing the classical themes with your instruments, or else using the orchestra to back your music – we did not want to do that – everybody has done it. We wanted to do something totally different – we thought, what if Mozart had guitar, bass, and drum – what would he have added to his compositions – so we had to invent and make music to fit this inside of his music. And let the people get comfortable without shock – to have a different experience about a another period of music but still be contemporary – have it be contemporary now. D: PFM has released a lot of CDs of live shows, so there is audio covering your entire career. There is a wonderful DVD of PFM live in Japan in 2003. 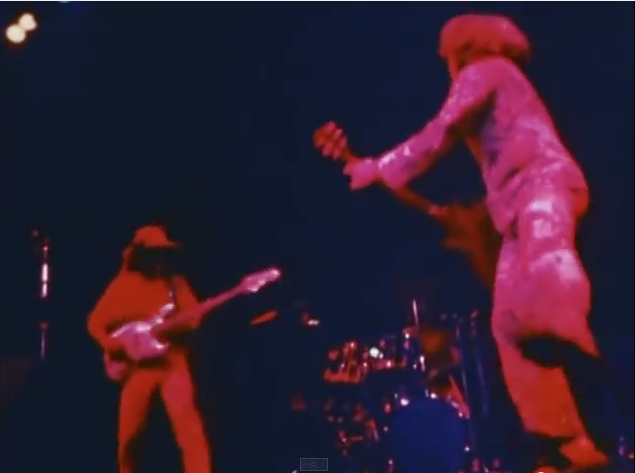 Have you thought about releasing a video history of the band? We played straight live, no lip-syncing, no overdubs – the music spoke for us. Most of our live performances sound better as there is more energy and adrenaline. We did Old Grey Whistle Test, Midnight Special, Don Kirshner in concert, the reason we got on the charts was because we played live. But we have no video tapes of that – they ask a lot of money for those. The DVD from Tokyo in 2003 took advantage of better technology. There is also video of the show in Siena Italy – released on audio as Piazza Del Campo Live in Siena (2008) – but it has not been released. Lucia Fabri was back on violin for that event and we played the solo together at the end of the show just as in 1974. D: In live performance it almost seems like you increased the tempo of many tracks and it could be at times simultaneously loose and tight like a train that could go off the tracks – was there almost a competitive spirit to play faster at the time? 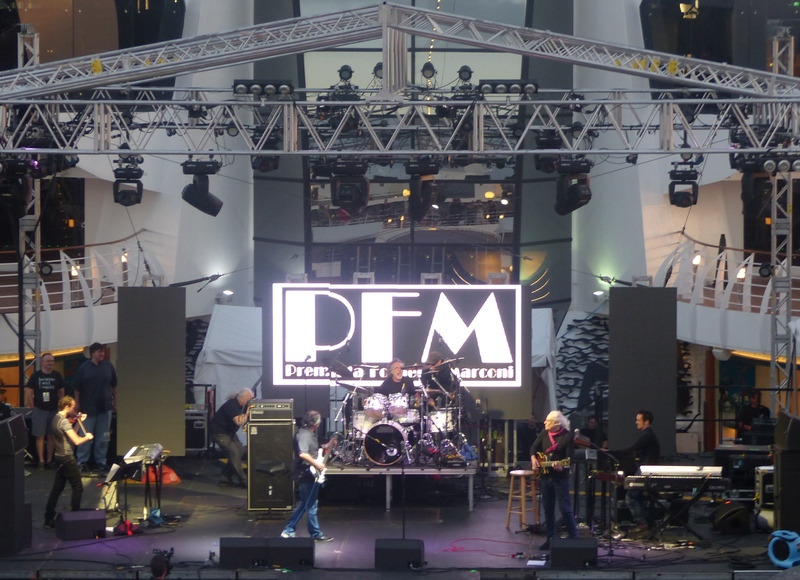 PFM: No – the reason it sounds that way is because we were playing more than 300 concerts a year and we would play very fast, almost too fast – not competing, just natural – tight and fast. For example last night when we played “Four Holes in the Ground” the count in was [taps out a slower tempo] but in those days it was more like [plays out a rapid fire tempo]. D: Will you tour more in support of Pfm in Classic-Da Mozart a Celebration? 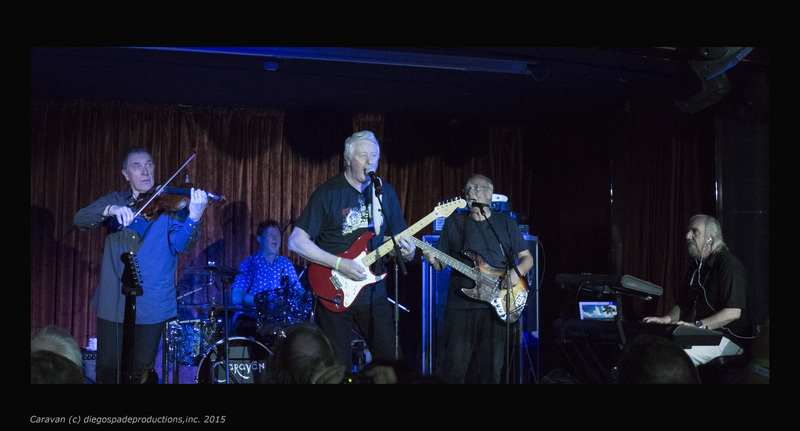 PFM: We have done some shows – our manager is figuring out where else we can play. The challenge is you have to go to a place and hire the orchestra instead of trying to take them with you. Everyone who plays with an orchestra has to do this. But we could take PFM plus say 5 additional musicians – a chamber orchestra but not a full one. For instance, last night we played “Romeo E Giulietta” and it came out well. Here’s hoping for more chances to catch the amazing PFM live soon – with or without orchestra!